Take advantage of this summer’s vibrant bounty from local farmers' markets, farm stands, or even your own backyard with this delicious recipe. Serve this fresh summer salad with plenty of crusty bread to soak up the flavorful tomato juices. Whisk together vinegar, olive oil, sugar, salt, and pepper in a small bowl. 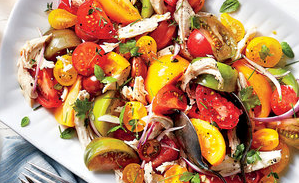 Gently toss together chicken, tomatoes, onion, basil, chives, parsley, and thyme in a large bowl. Add vinegar mixture, and gently toss until thoroughly combined. Serve immediately, or cover and let stand at room temperature for up to 1 hour.